Happy Sunday everyone! To make everything exciting in my blog, I have a new column you should watch out for. Every Sunday, I will feature a fashion blogger here at Remake Style and interview her to share you with her style and maybe give a few ups for fashion advice. I am officially calling it Sunday Spotlight. 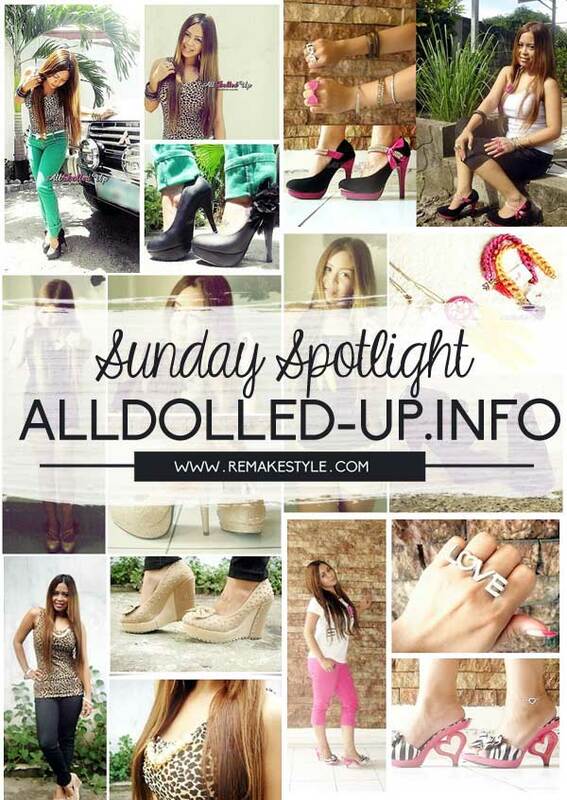 So for the first Sunday Spotlight, here is Yesha of AllDolled-Up.info. When did AllDolled-Up started? How did you come up with the idea of starting this blog? ALL DOLLED-UP started last April 2011. Since I love dolling up, fashion, makeup, girly stuff and the like, I thought why not put up a separate blog where I can share ideas specifically about beauty, fashion, products and web stores that I highly recommend, girly stuff like nail art designs, my OOTD’s (Outfit of the Day), my shopping lists, etc. It is also my way to inspire other girls. I was also thinking, I can’t put fashion and beauty posts in Sweetposh.com (my first blog) which has random posts. I believe you should have a niche when putting up a blog. How would you describe yourself and your blog? Two words. Glamorous and very feminine. Where do you get your inspirations from? Who is your favourite fashion icon? My favorite fashion icon would have to be Tsubasa Masuwaka, Tyra Banks and Audrey Hepburn, they are the most elegant woman and they are lovely inside and out. What is your favourite segment in your blog and why? What is your favourite post? My favorite segment in my blog is PRODUCT REVIEW obviously :)). I like trying new beauty products and share my thoughts about it. This way, I can help other girls to choose only the best products that are worth the money. My favorite post? Hmmm, I truly like the whole thing in my blog because I constantly put effort in every post. I make sure that every visitor in my blog will read thought-provoking and useful entries. What do you do whenever you don’t blog? Any advice on those who wants to start their own fashion blog? My advice is DO IT ONLY if you LOVE fashion. If you don’t, it won’t be as fun as you wanted it to be. Always put your heart in everything you do. You may check her blog for more precious products, stores, OOTD, NOTD recommendations. I personally love her NOTD because they look very pretty. You can also fan her on Lookbook for more gorgeous outfit posts. Stay tuned for more blogs at Sunday Spotlight. Follow me on Facebook and Twitter to stay updated. Waaaah how timely, Yesha is a good online friend of mine! I met her waaaaaay back when I was only starting to blog on my current domain. As a fan of Japanese fashion myself, I also like Yesha's style. Looking at this post, I can also say she has such cute shoes lol! Yaayy! She was also one of those friends I had when I started out, I received my first domain from her (pixieheart.info) which too bad I didn't renew. And yeah, I love her shoes. Good interview. She is so pretty and fashionable. I guess she have a lot of nice shoes too I love reading her blog because of those informative product reviews and I also like her NOTD posts. I hope she can post more notds. She inspires me to make a blog and hope to put up one very soon.